One night, they found themselves under some mistletoe. Now, he owes her a kiss. And she is determined to claim it. HIS HEART TORN in two, Graham Astor, Duke of Kensington, mourns his wife. As he distances himself from everything that reminds him of happier days lost forever, he comes to realize that there is one thing he cannot run from. Graham needs a new wife, if only for the sake of his daughter. DISILLUSIONED WITH LOVE, Rosabel only wishes to not remain a burden to her uncle’s family much longer. After seeing her parents’ love turn against them, Rosabel dreams of an independent life as a governess. But then a stranger asks for her hand in marriage, and to her utter shock her uncle instantly agrees. Will Rosabel find love after all? Or will the memory of Graham’s late wife keep him from finding happiness? *This is not a tale of love at first sight. This is a story of two wounded people, who need to find the strength to face their fears and overcome them in order to find their happily-ever-after. A story filled with drama, joy, emotional turmoil as well as a touch of mystery, that will make you laugh and cry and scream at the characters. 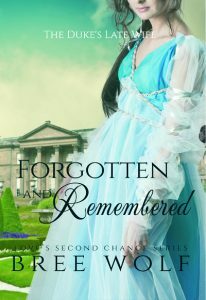 A clean Regency Romance with some sizzle!